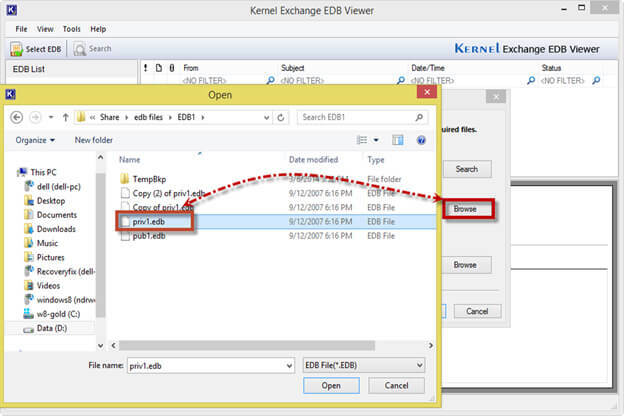 Kernel Exchange EDB Viewer is the freeware and self-sufficient utility for authorizing next-gen email users to read and manage raw EDB data files without necessitating the Exchange Server email infrastructure. The software offers outstanding user interface and works effortlessly with EDB files of MS Exchange Server 2016, 2013, 2010, 2007, 2003, 2000, 5.5, and 5.0 versions. One can easily adapt to the software functioning as it is embraced with user-friendly interface. 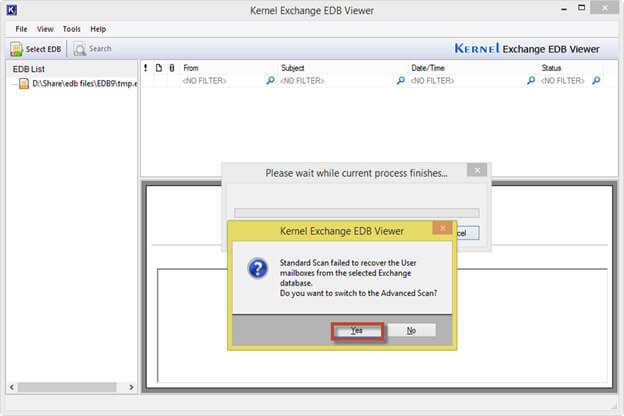 As soon as you launch the Kernel Exchange EDB Viewer tool, the following interface screen is displayed. 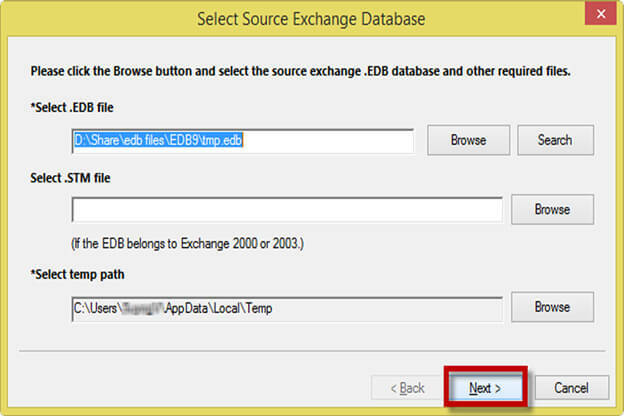 Click the Browse button to upload the desired EDB files while selecting file from the Open dialog box. If you’re unable to find the desired EDB files, then click the Search button to trigger the in-depth file searches on selected hard disk drive. After attaching the desired EDB file, click the Next button to continue. 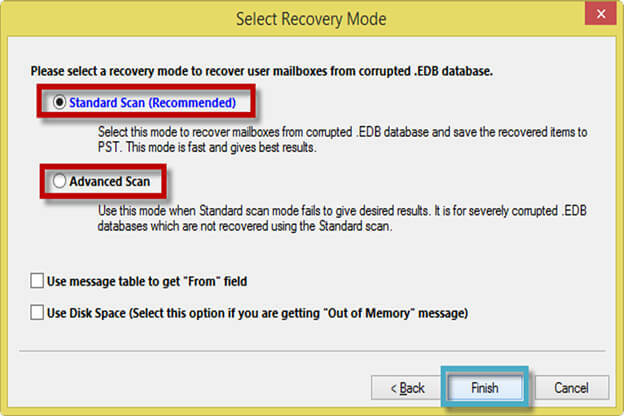 Select either Standard Scan or Advanced Scan option in accordance with the severity of EDB file corruption, and then click Finish to proceed. 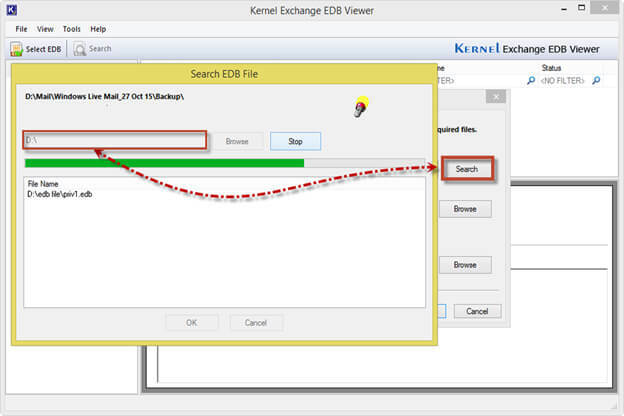 The software displays the Kernel Exchange EDB Viewer dialog box prompting user to switch to Advanced Scan if the corruption couldn’t be dealt with Standard Scan. Click Yes to continue. 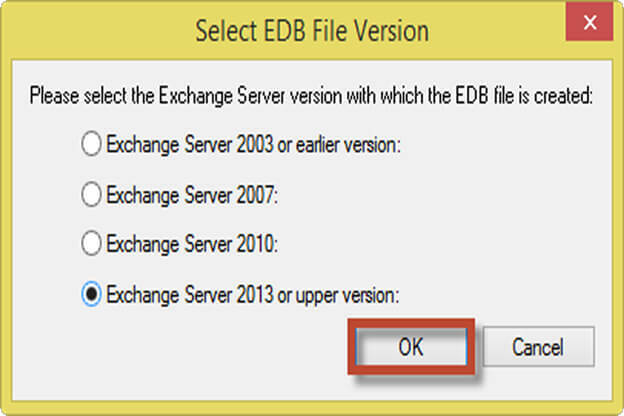 Select the appropriate EDB file version, and then click OK to facilitate accurate EDB file viewing experience. The software robustly generates an intuitive display of EDB data files which can be explored while expanding each EDB folders from the left pane as shown in the screenshot. Click individual email to obtain the preview of content. 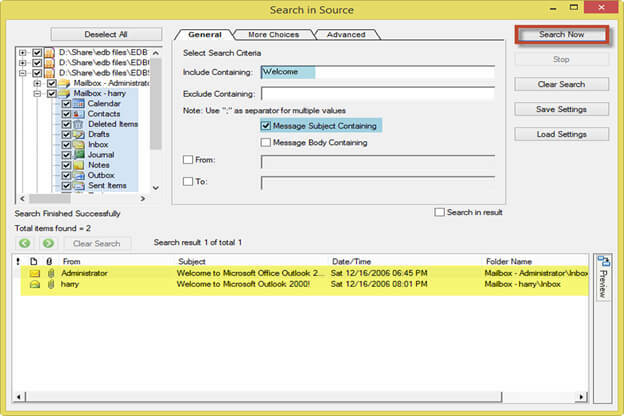 The software offers an intelligent Search functionality which when clicked invokes the Search in Source wizard as shown in the screenshot given below. Specify Welcome in the Include Containing field, and then check the Message Subject Containing field. (Highlighted in Blue). Click the Search Now button to facilitate the email extraction. Check out the email results mentioned in the lower panel (Highlighted in Yellow). Similarly, you can configure other settings from More Choices and Advanced tab. At the end of the preview generation process, the software interface also pops-up the message to notify users for obtaining the Kernel for Exchange Server software if the user is interested in saving the EDB data files apart from just previewing them. 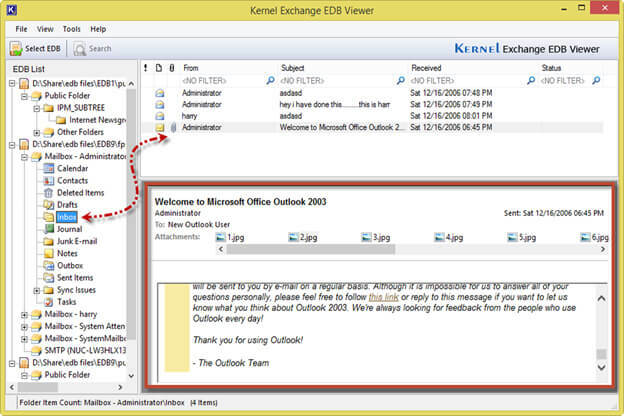 You can click the Kernel for Exchange Server link to navigate to the product page.